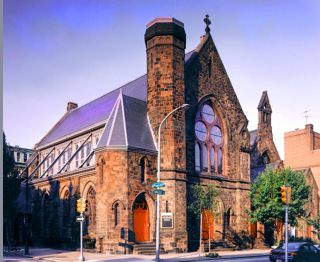 Trinity Memorial Church has served as a valued neighborhood institution for more than 120 years. Housed in a unique architectural structure, it has put down deep roots in the community as both a religious and a service institution from its earliest days. Throughout the church's history, worship, bible study, choirs and retreats have been balanced by home economics classes for immigrants, sports clubs, social gatherings for local residents and charitable activities. Around midnight on July 28, 1994 a huge bolt of lightning struck Trinity Memorial Church, shorting out its alarm system and starting a fire under the roof that smoldered undetected for about 4 hours. By the time the fire department was called at 4:15 a.m., the blaze was consuming the roof. The fire destroyed the roof, reducing massive ceiling timbers to splintered rubble, blackening the upper sections of the stone facade, and breaking many of the stained glass windows. The water damage was enormous as well. In an overwhelming display of community support and generosity, more than 800 individuals, friends, businesses, and community organizations contributed to the rebuilding efforts in the weeks that followed. Thanks to their support and the insurance proceeds, we were able to restore and rebuild after $2.5 million of fire damage. The sanctuary was officially rededicated in May, 1997. It has been 30 years since the fire. The promise of the rebuilding efforts that concentrated on creating a space that was flexible enough for worship and could also be used for fundraisers and artistic performances has been realized. The beautiful worship space is popular for concerts, dancers and weddings.